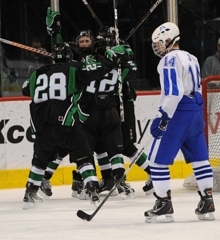 Sophomore forward Zach LaValle scored twice in the third period to lead Hill-Murray to a 5-3 comeback victory over Minnetona in the championship game of the Schwan Cup Gold Division on Saturday, Jan. 1, at the Xcel Energy Center in St. Paul. The Skippers (6-3-1) took a 3-1 lead into the second period after Steve Johnson and Connor Ryan scored in the opening two minutes. Ben Bahe scored for Hill-Murray (7-2-1) 9 minutes, 35 seconds into the second period to pull the Pioneers to within 3-2. Hill-Murray senior Bobby Bruski tied the score at 3 just 1:59 into the third, setting up LaValle’s heroics and continuing a disturbing trend for the Skippers. Minnetonka has been outscored 16-9 in the third period this season. The game was a rematch of an epic state Class 2A semifinal last March. 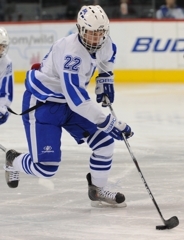 Minnetonka won that one 2-1 in four overtimes. Sophomore Vinni Lettieri scored for Minnetoka. 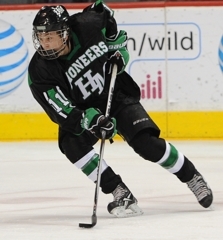 Jake Guentzel and Ben Bahe added goals for Hill-Murray, which has won seven straight after a 1-2-0 start. 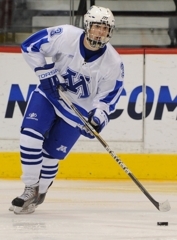 Pioneers goaltender Tim Shaughnessy made 21 saves while the Skippers’ Alex Glockner stopped 24 of 29 shots. The sophomore forward’s two goals in the third period won’t make any highlight reels, but what they lacked in artistry they made up for in importance. LaValle has eight goals this season, and five of them came during the Schwan Cup. The senior goaltender finished with 21 saves and was at his best in the third period, when he allowed the Skippers precious few second-chance shots. The sophomore forward scored in the first period and added an assist in the second. He also dished out several hard hits, the byproduct of his relentless forechecking. Click here for a story that includes comments from the coaches and Hill-Murray forward Zach LaValle.